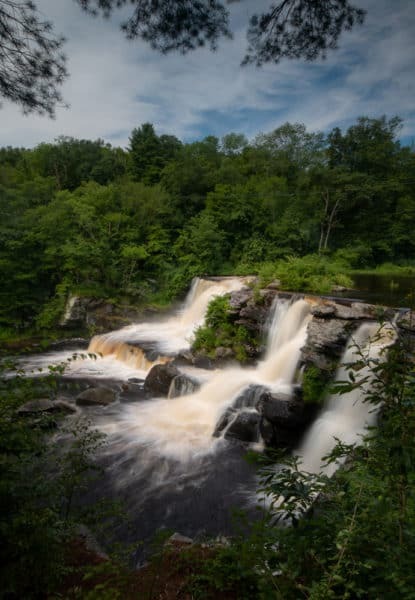 A short distance north of Stroudsburg, Pennsylvania, is one of the most impressive and easiest-to-reach waterfalls in the Poconos: Resica Falls. 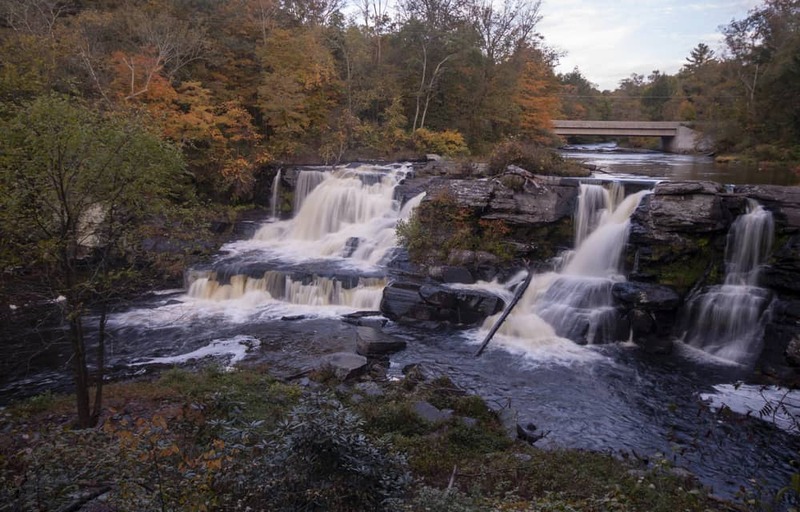 Resica Falls is located along Bushkill Creek on the property of Resica Falls Scout Reservation. 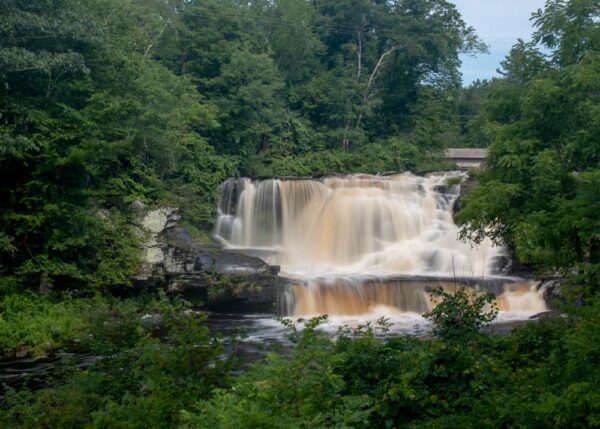 Fortunately, thanks to a joint project of the Pennsylvania Department of Natural Resources and Monroe County, visitors are allowed to visit this beautiful waterfall. Resica Falls is one of the most impressive waterfalls in the Poconos. 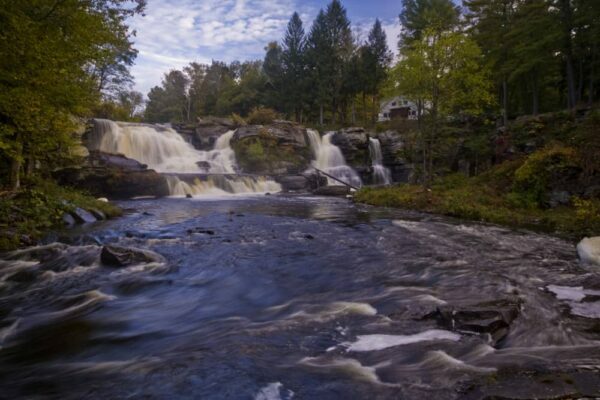 Resica Falls is roughly 25-30 feet in height and probably 50-60 feet wide. However, exact measurements are hard as visitors must remain on the designated paths which prohibits you from getting down to water level to get a better gauge for the height. Except in times of extreme high water, Resica Falls features three separate streams of water, which really give this waterfall a unique look. Each part of this waterfall is quite beautiful, though it can be hard to get an unobstructed view of the entire falls because of the undergrowth that has grown up around the falls in recent years. This photo was taken about three years prior to the one above and shows how much the foliage around the falls has grown. There is a parking area big enough for a few cars near the entrance to the scout camp and directly across Arnold Drive from the entrance building. From here, a path leads along the creek for roughly 100 feet until the waterfall comes into view. A fixed rope has been set up around the area near the falls and visitors are required to stay within this designated area. 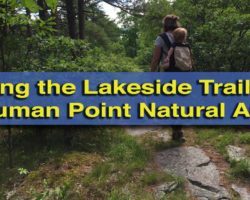 Given that the camp has been gracious enough to allow access, don’t go beyond the allotted area, especially since there are security concerns with visitors trespassing at a camp for kids. 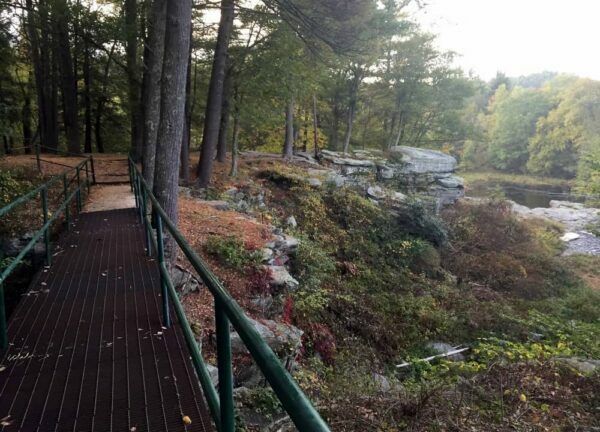 There is a nice trail and view area set up for Resica Falls. 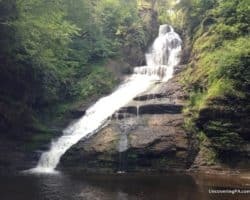 While it would be nice to access some of the lower areas closer to the falls, most of the best vantage points for views of the waterfall are within the area that you can visit. Thanks to Bushkill Creek narrowing just downstream of the falls, there’s a nice frontal view of the waterfall from rocks a few feet above the falls. There is also a nice side view of the waterfall on the path from the parking area. A side view of Resica Falls. 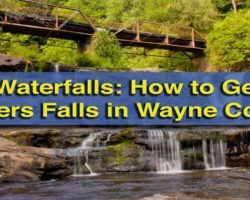 Most of the best views of Resica Falls require you to be able to climb up sloped rocks, but there are still views, especially from the side, for those that have trouble with uneven terrain. This is the type of project that I love to see the local and state government funding. Since this waterfall is on private property, and especially because it’s on property for a kid’s camp, it wouldn’t be surprising for it to be off limits. Fortunately, though, this gem is open to the public. 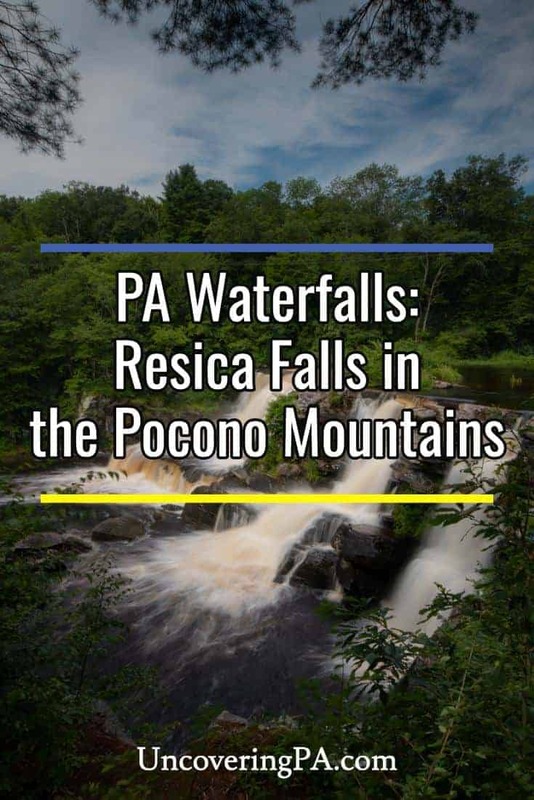 So, the next time you are in the Poconos or hiking in the Delaware Water Gap National Recreation Area, don’t miss the beautiful Resica Falls. A closer look at the left most corner of the waterfall. 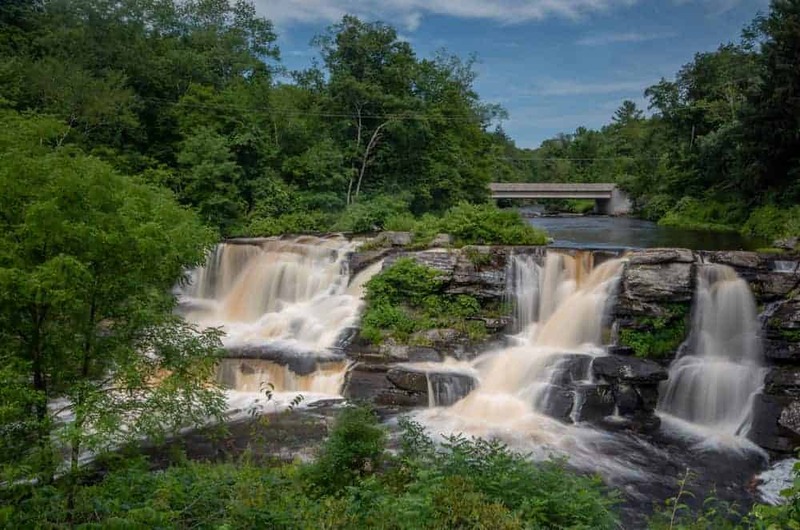 Resica Falls is located 20 minutes north of Stroudsburg in Monroe County, Pennsylvania. It can be found just off of Resica Falls Road at the following coordinates: 41.110319, -75.094392. The parking area for the falls is adjacent to the entrance for Resica Falls Scout Reservation. The road is noted as Arnold Drive on Google Maps, though its more of a wide driveway than a road. Park in the small parking area on your right before passing any of the buildings, and do not drive into the camp. As a reminder, this camp is closed to the public with the exception of the land around Resica Falls. Make sure to stay within the roped in area during your visit. Looking for other places to visit nearby? 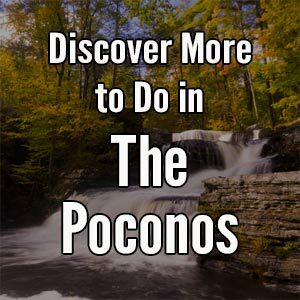 Check out the waterfalls of Slateford Creek, the Pocono Indian Museum, and Tumbling Waters.